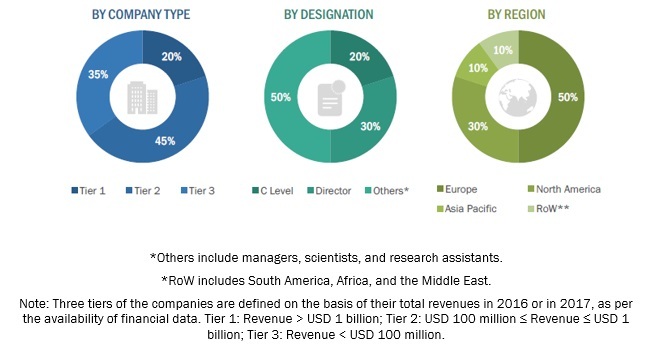 [153 Pages Report] The pesticide inert ingredients market is estimated to account for USD 3.5 billion in 2018 and is projected to reach USD 4.7 billion by 2023, at a CAGR of 6.14% during the forecast period. The need to ensure food security and cater to the requirements for pesticides in the agricultural industry drives the market for pesticides inert ingredients. On the basis of type, the emulsifiers segment is projected to witness the fastest growth during the forecast period. Emulsifiers help in stabilizing the mixture of two liquids and avoid the formation of immiscible liquid phases. Major emulsifiers that are used as inert ingredients are polymers, nonylphenol and alcohol ethoxylates, and alcohol alkoxylates. The demand for emulsifier-based products remains high in the North American region due to the increasing industrialization and decreasing land area for agriculture, which in turn, creates demand for the use of pesticides for ensuring food security and production. With the increasing demand for organic fruits and vegetables, the bio-based segment is projected to witness the fastest growth, on the basis of source. It has been witnessed that some of the inert ingredients used in pesticide formulation are more toxic than the active ingredients. Increasing health hazards associated with the usage of synthetic-based inert ingredients in pesticides creates an opportunity for the market players to develop bio-based inert ingredients from sources such as microbes for the formulation of bio-based pesticides. Governmental bodies and regulatory authorities have introduced regulations for the use of toxic pesticides, which affects the growth of bio-based inert ingredients in the market. On the basis of form, the liquid segment is projected to account for a higher share in the pesticide inert ingredients market during the forecast period. Liquid inert ingredients reduce waste and have a larger target coverage area. In addition, the uniformity and ease in mixing the liquid inert ingredients in pesticide formulations are key factors driving the demand for these forms among local manufacturers in developing countries. Thus, the liquid segment is estimated to dominate the pesticide inert ingredients market. Most of the pesticide formulations are also available in liquid form and thus the share for the liquid segment is projected to remain high. 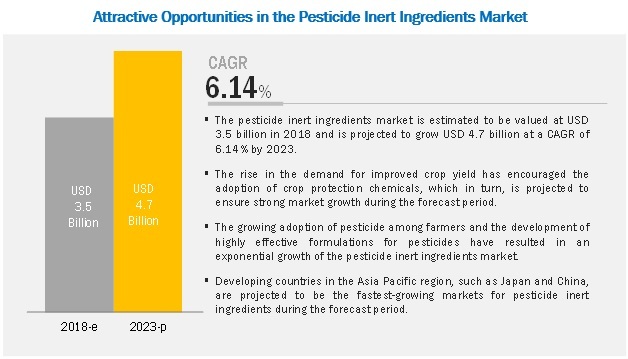 Asia Pacific is projected to witness the highest growth in the pesticide inert ingredients market during the forecast period. The Asia Pacific region is one of the leading consumers of pesticides across regions, even though the region mainly depends on imports for pesticide supply. Inert ingredients are increasingly consumed by pesticide manufacturers at the production facility during the formulation stage, and countries such as India, Thailand, and Vietnam depend on imports for pesticides. Hence, the market for pesticide inert ingredients remains smaller when compared to the Americas and Europe. However, the pesticide inert ingredients market is well-established in developed countries with the increasing establishment of production plants in the Asian countries. Due to these factors, the use of inert ingredients along with pesticide application is projected to increase in the future. Major market players in the pesticide inert ingredients market are BASF (Germany), Clariant (Switzerland), DowDuPont (US), Stepan Company (US), and Croda International (UK). BASF SE (Germany), one of the world’s largest chemical companies, operates through seven major segments. With a broad product range, diverse customer base, and operations in more than 80 countries through its joint ventures and subsidiaries, the company has marked its presence on the growth trajectory. DowDuPont is another leading player wherein, Dow Crop Defense focuses on providing inert and additive ingredients, which enhances the effectiveness of pesticides and adjuvant formulations. This, in turn, helps farmers to produce and offer healthier crops. There are some other players in the industry, which are focusing on serving the market with various inert ingredient products and capturing a larger market share such as Eastman Chemicals (US), Solvay (Belgium), Evonik (Germany), Huntsman Corporation (US), Akzonobel (The Netherlands), Royal Dutch Shell (The Netherlands), and LyondellBasell Industries (Netherlands). In November 2018, Clariant expanded the production capacity of its ethylene oxide (EO) unit in Gendorf, Germany. The expansion resulted in serving customers of various industries such as personal and home care, crop solutions, and industrial application, with EO-based products. In May 2018, Solvay signed a three-year contract with Beifeng Hengtai Agricultural Development Co., Ltd. to launch a product called AgRho NH4 Protect. It is an eco-friendly liquid surfactant, which can be applied on NPK compound that is the most popular fertilizer in China. In June 2017, Stepan, through its subsidiary in Mexico, entered into an agreement with BASF Mexicana. This agreement was focused on the acquisition of BASF Mexicana’s surfactant production facility in Ecatepec and a portion of its associated surfactants business. Which market segments to focus on in the next two to five years for prioritizing efforts and investments? Which region will have the highest share in the pesticide inert ingredients market? Which type of pesticide inert ingredients witnesses high demand in each key country market? What are the trends and factors responsible for influencing the adoption rate of bio-based inert ingredients in key emerging countries? 12.11 Lyondellbasell Industries Holdings B.V. The study includes four major activities to estimate the current market size for pesticide inert ingredients. Exhaustive secondary research was done to collect information on the overall market and the peer market. The next step was to validate these findings, assumptions, and sizing with industry experts across value chain through primary research. Both top-down and bottom-up approaches were used to estimate the complete market size. Thereafter, data triangulation was used, and the market breakdown was done to estimate the market size of segments and subsegments. In the secondary research process, various secondary sources were referred to, so as to identify and collect information for this study. The secondary sources included annual reports, journals, associations such as The Federal Insecticide, Fungicide, and Rodenticide Act (FIFRA) and Environmental Protection Agency (EPA), press releases and investor presentations of companies, white papers, certified publications, articles from recognized authors, gold & silver standard websites, regulatory bodies, trade directories, and databases. Secondary research was mainly used to obtain important information about the industry’s supply chain, the market’s value chain, key players, and the market classification and segmentation, according to industry trends to the bottom-most level and geographical markets. It was also used to obtain information on key developments from a market-oriented perspective. The market comprises several stakeholders in the supply chain, which includes raw material suppliers, service providers, genetic research institutions, seed companies, and end-use farmers. Various primary sources from both, the supply and demand sides of the market were interviewed to obtain qualitative and quantitative information. The primary interviewees from the demand side include key opinion leaders, executives, vice presidents, and CEOs of companies producing commercial seeds. The primary sources from the supply side include plant breeding service providers, genetic solution providers, R&D institutions and organizations, and key opinion leaders. All the possible parameters that affect the markets covered in this research study was conducted in extensive detail, verified through primary research, and analyzed to obtain the final quantitative and qualitative data. After arriving at the overall market size from the estimation process explained above, the total market was split into several segments and subsegments. In order to arrive at the exact statistics for all segments and subsegments, the data triangulation and market breakdown procedures were employed wherever applicable. The data was triangulated by studying various factors and trends from both, the demand and supply sides. Along with this, the market was validated using both top-down and bottom-up approaches. BASF SE (Germany), Dow Chemical Company (US), Stepan (US), Clariant (Switzerland), Stepan Company (US), Eastman Chemicals (US), Croda International (UK), and Solvay (Belgium). This research report categorizes the pesticide inert ingredients market based on type, source, form, pesticide type, and region. Further breakdown of the Rest of European market for pesticide inert ingredients market into Netherlands, Belgium, and Switzerland. Further breakdown of the Rest of Asia Pacific market for plant breeding into Thailand, Australia, Malaysia, and Indonesia.